Chart set up: The USDJPY briefly slipped below the support level at 112.74 only to recover. Price action has remained subdued for the most part as eventually the support area was tested once again. Failure to have posted any higher highs in the past week is starting to see the sentiment turn bearish. However, the USDJPY’s reaction to the support level will be crucial in determining the next leg of the direction. In the medium term, the USDJPY remains range bound and directionless. We expect the sideways range within 113.58 and 112.74 to be maintained. A retest of the resistance level could however signal a downside bias if it isn’t cleared. 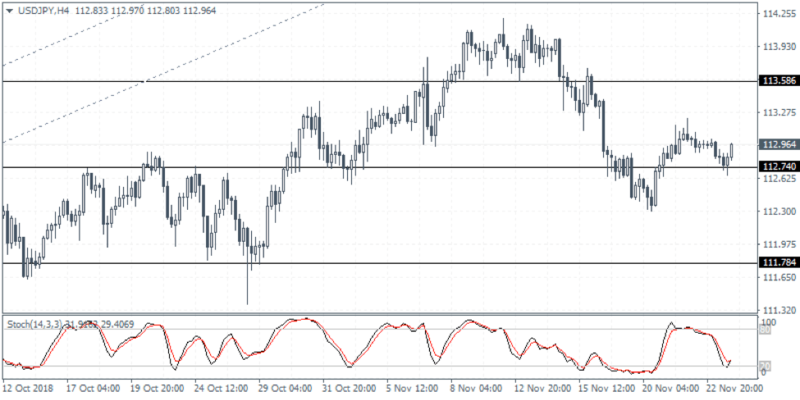 The lower support at 111.78 will be tested in the near term if the support clears way following the test of resistance. The market sentiment will also be playing a crucial role. A risk averse mode could potentially see the inflows into the yen which could result in the USDJPY falling below the support and extending the declines even further. For the week ahead, the USDJPY currency pair is expected to be flat.